DON'T SKIM THIS POST! I think Heather has some pretty awesome things to say here. To a single woman living in the 21st century, virtues like purity and chastity seem quaint and old fashioned. Right now over half the children born to women under the age of 30 are born out of wedlock. It seems to be a given that couples will cohabitate before they marry. And even Christian couples seem to struggle with the seriousness of sexual compromise. I recently read an article that cited over 60% of evangelicals when asked whether the church should supply birth control to singles, answered in the affirmative. And the temptations aren't limited to the unmarried. We hear of church leaders caught seeking intimacy outside their marriages. Sometimes even "harmless" friendship with someone other than your spouse, crosses the line into a little flirtation, often deemed harmless but never is. Then Brownback takes us through the picture of the immoral women, found mainly in Proverbs 5 and 7, but referred to in other parts of the book. She’s also known as the adulterous woman, or the strange woman if you’re really old school. Brownback uses her to depict the opposite of the Proverbs 31 woman, a woman who lives without wisdom. This is around when I began to squirm uncomfortably. Not because Brownback is in any way explicit, but because I felt fairly confident that I couldn’t possibly be at all like the immoral woman. After all, I’m not rushing out to the streets and catching young men who lack sense, but Brownback opens up the picture of this woman to reveal how she might not be so far from all our hearts after all. What stood out to me in particular was the immoral woman is a discontented woman. “She is loud and wayward; her feet do not stay at home;” (Proverbs 7:11). Have you ever been a single woman angry at God for not providing a husband? Have you ever been a married woman discontent with the husband God gave you? Have you ever been a woman upset because her life or marriage or career or house doesn’t look the way you wanted? I guess this strange woman isn’t so strange after all. There is something I’d like to commend Brownback for saying. On the immoral woman’s tendency to fuel her lust, Brownback says, “Lust is typically thought of as a man’s issue, but that’s incorrect. Lust is not a gender issue; it’s an opportunity issue.” I’ve been waiting a long time for someone to admit that. In this culture, lust is particularly hard to avoid and the denial of women’s struggle with it, by well meaning Christians, is not helpful. I also think it leads women to think their lust is somehow ok, perhaps more innocent than a man’s. But Brownback doesn’t just stop there. She doesn’t just acknowledge that “everyone does it” and shrug her shoulders and say there is nothing we can do. She offers concrete practical steps we can take to flee temptation. Mostly she reiterates that we can’t do it alone, only by cultivating the type of wisdom that comes from the knowledge of God and a relationship with Jesus Christ. After the bleak picture of the immoral woman, Brownback brings us to the last chapter of her book, the picture of what a wise woman really does look like. 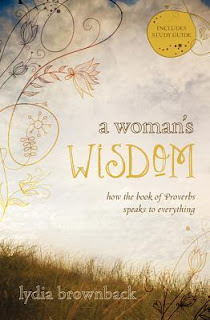 She ends with a look at the Proverbs 31 woman. We Christian women definitely know about her. We’ve heard about her so much, that we may be tempted to groan when we read that this is the last chapter in Brownback’s book. I was recently talking with a friend when the subject of the Proverbs 31 woman came up. “She makes me feel so guilty!” my friend confessed. I wondered why this was. Why Proverbs 31 and not Hebrews 11 (the faith in action chapter), or even the list of the fruits of the Spirit? I wondered if perhaps my friend had come across too many discussions of the Proverbs 31 woman as a guidebook for how to be a better person. And upon finding that this woman is too high an ideal, became frustrated in this approach. Lydia Brownback takes a fresh look at the Proverbs 31 woman by first of all pointing out the structure of the poem. “Proverbs 31:10-31 is a poem set in the form of an acrostic, which means that each stanza begins with a different letter of the alphabet, in this case the Hebrew alphabet.” Not only that but the poem is set in a chiastic structure (http://en.wikipedia.org/wiki/Chiastic_structure this link should be attached to the words “chiastic structure”) with the focus being on verse 23, “Her husband is known in the gates when he sits among the elders of the land.” So really, the onus of Proverbs 31 is actually on men to be wise in their search for a wife who could bring him respect or shame. Since it was written by the mother of King Lemuel as advice on finding a suitable partner, this makes sense. Interesting thought that lust for things we are not to have starts with discontent for what we do have. And we need repeated reminders that we can't be Proverbs 31 women on our own. This book sounds really good. I pray whoever receives the free books will enjoy them & truly grow in wisdom! Wow Heather! Nice work. Yep, now I REALLY want to read this book. This is a great post! Would you say the book is age appropriate for teen girls? I am more excited about this book each day! Thanks for that last paragraph, Heather (and really, all of your thorough insights). Pointing us to Christ is what I need. Today. Everyday. You girls have done an awesome job this week with these reviews. Thank you Carrie and Heather. I agree with Annette. Very thorough reviews and good words shared here this week. Thanks for reviewing this one! @Monica: Absolutely. Brownback does not candy coat anything, but she is very careful in her wording in the "wisdom in our sexuality" chapter. I would recommend this to moms to read with their daughters, with no qualms at all. I am enjoying this series of reviews more than I expected. Well done, Heather. 1. It was brilliant to connect the "immoral woman" to discontent, and note that there is a double standard when it comes to lust. Our society (and unfortunately the Church as well) treat discontent differently for men and women. A man who is discontented with his wife is a cad. A woman who is discontented with her husband is justified, because he is clearly inadequate. And then, a man tends to just have an affair. (It's not just men, but seems to be more men than women.) The woman, as my pastor put it, tends to try to make the man miserable enough that he leaves (so she doesn't have to, and can then be the victim). In both cases, the discontent has led to the failure of the marriage, and we should acknowledge that. I am impressed that the author was brave enough to tackle the issue. 2. I love your take on Proverbs 31. Why do we seem to need to make everything a formula? What struck me about the passage from a fairly young age was that the Godly Woman brings her husband good and not evil. As guys would say, she brings something to the table, and doesn't take anything off. Really, this should be something both spouses consider seriously: "Am I making my wife/husband's life easier, or harder? Are my actions making him/her more or less likely to want to come home to me?" Living by a formula, a checklist, a rigid idea of roles, doesn't accomplish this. A loving heart does. With that focus, it isn't about what the other person owes you, and therefore there is no reason for discontent. Again, well written and thoughtful. Excellent post Heather! This book really seems to be honest about things it's easy for us to skirt around and ignore, but need to be reminded about. Carrie, I've been out of the bloggy world for awhile, but am so glad I tuned in today to read this week's posts. This book sounds great. Please include me in the drawing! Y'all have done an awesome job of convincing me to read this book! Yes, please, I'd like to win! thanks for sharing this week of posts. The thought about discontent being a root of lust--totally new angle for me and eye opening. Thanks for sharing!